Curious about why I find aging so damn interesting? Why I dislike the term “successful aging” so heartily? Why I’ve become an Old Person In Training? What’s my slogan for a radical age movement? Answers to these and a few other good questions below. You want to reframe the way American culture sees age and aging. What got you started on this path? About eight years ago I began interviewing people over 80 for a project called “So when are you going to retire?” and reading about longevity. It didn’t take long to realize that almost everything I thought I knew about aging was wrong. I had no idea that people are happiest at the beginnings and the ends of their lives, for example. That the vast majority of Americans over 65 live independently. The older people get, the less afraid they are of dying. Why don’t more people know this stuff? Because we live in a culture that drowns out all but the negative about growing old, or even just aging past youth. Why is that? Because social and economic forces frame aging as a problem, so they can sell us remedies to “fix” or “stop” or “cure” it. Aging is a natural, lifelong, profoundly enriching process—experience tells us so. Aging means living, which is why it’s so damn interesting. And to paraphrase British journalist Anne Karpf, it makes no more sense to be anti-aging than anti-breathing. How did you arrive at the arresting cover design? We gave brilliant designer and friend Rebeca Mendez a tough commission: come up with a cover that feels warm and human but also sharply political. And will jump out at readers from a crowded bookstore window. She was scratching her head until my partner suggested that the epigraph of the book might serve as inspiration. It’s a quote by the wonderful writer Anne Lamott: “We contain all the ages we have ever been.” Rebeca’s painting beautifully captures that idea. An ageist society aspires to “agelessness,” an artificial and unattainable goal that strips us of our years. I love the way the cover represents the opposite, which I call “agefulness”— a rich accretion of all the things we’ve done and been, stored within our bones and brains, that makes us who we are. If you could banish one stereotype about aging, what would it be? The notion that older people are alike! It’s why people think everyone in a retirement home is the same age—“old”—even though residents can span four decades. (Can you imagine thinking that way about a group of 20- to 60-year-olds?) It’s why the last box on those marketing checklists – you know, 18-26, 27-39, etc., end at 65+—as though everyone over 65 buys the same stuff and does the same things. Stereotyping—the assumption that all members of a group are the same— underlies all the “isms.” It’s always a mistake, but especially when it comes to age, because as the years pass, of course we grow more different from one another. It’s why geriatricians say: “If you’ve seen one 80-year-old, you’ve seen one 80-year-old.” We all age at different rates —mentally, physically, and socially—which is why there’s no such thing as “acting your age.” Chronological age tells you almost nothing about an individual—not what they’re listening to or who they’re voting for or where they’re headed—and the older the person, the less reliable an indicator it becomes. You make a case for an anti-ageism campaign as a public health initiative. Tell us about that. A growing body of evidence shows that attitudes towards aging have an actual, measurable, physical effect on how we age. There’s no inherent reason for the effect to be negative. But an ageist culture tells us that wrinkles are ugly. Old people are incompetent. It’s sad to be old. When we assimilate these stereotypes, they become part of our identity, and this influences how our brains and bodies function. In one experiment, social scientists primed a group of college students with negative age stereotypes—words like “forgetful,” “Florida,” and “bingo”—that they flashed on a screen too briefly for the subjects to become aware of them. The students then walked to the elevator measurably more slowly than a control group! Imagine the effect on older people for whom the terms are more relevant, and thus more likely to become self-fulfilling prophecies. People with more positive feelings about aging behave differently from those convinced that growing old means becoming irrelevant or pathetic. They do better on memory tests and have better handwriting. They can walk faster and are more likely to recover fully from severe disability. And they actually live longer—an average of seven and a half years. Everyone agrees that health has the biggest effect on how we age—and how much it costs. So think what a national anti-ageism campaign would do to extend not just the lifespan but the “healthspan” of all Americans. Why do so many of us have such a hard time actually admitting our age…saying it out loud? You’d have to live in a cave to miss the messages all around us that old=bad, and that aging is to be feared and avoided by any means necessary. No wonder so many of us are reluctant to part with the equivalent of a cultural “sell-by” date! It’s an understandable strategy. Attempting to “pass” for younger, the way people of color have passed for white and gay people for straight, is a way to avoid being discriminated against. But “passing” takes a psychological toll, because it’s rooted in denial and distaste, even disgust. We’re reluctant to divulge our age because we’ve internalized the profoundly ageist notion that our older self is inferior to our younger one. Do you honestly think that the person you are now has less to offer than the twenty- or thirty-something you once did? That you’re less interesting now? Less valuable? How about less attractive? If that gets a nod, consider the industries that make billions by commodifying our dissatisfaction with our bodies—especially women’s. Who gets to decide that wrinkles are ugly? It’s time to look more generously at ourselves, the way the body-acceptance movement urges, and to stop colluding in devaluing ourselves as older women. When we claim our age, the number loses its power over us. It’s a little like a spell breaking. We can’t stop aging, even if we wanted to, but we can change the way we feel about it—the first step in any revolution. Then we can start to see where those ageist messages come from, and work together to challenge the structures that benefit from them. Terms like “successful aging” and “productive aging” and “active aging” are popular, and provide an upbeat counterpoint to the standard narrative of aging-as-decline. They’re seductive, because we really, really want to think we can keep doing the things we love for as long as we live. We often can—versions of them, that is—especially if we have access to healthcare, and exercise, and eat well. But the goalposts shift. In addition to taking care of ourselves, we’d do well to decouple self-worth from longstanding measures of earning power or physical prowess. Much is not under our control, and making the necessary supports available to all older Americans will require implementation at the policy level. It’s important to keep in mind that many of the resources that help us “age well” are predominantly available to the lucky and reasonably well off. Sanitized or romanticized exemplars of “successful aging”—those silver-maned couples waltzing on the foredeck of a cruise ship—set an unreasonable standard and suggest that less “successful” agers are responsible for their circumstances. Everyone can make sensible choices, but barriers like heavy caregiving responsibilities, inadequate health care, and neighborhoods with few resources make it more difficult. Blaming the poor for “bad choices” makes aging another arena in which we succeed or fail based on terms that are far from neutral. There’s a lot of harsh judgment of olders who aren’t physically mobile or conventionally economically productive, and that’s not OK. All aging is successful—not just the sporty version—otherwise you’re dead. Are olders really as much of an economic drag on society as the media portrays? Absolutely not! People 50 and up fuel the significant, fast-growing, and often-overlooked “longevity economy,” which according to AARP accounted for 46 percent of US gross domestic product ($7.1 trillion) in 2012. By 2021 the 50-plus age group is projected to drive more than half of US economic activity, as their spending fuels industries that include apparel, health care, education and entertainment. These statistics capture only part of the economic contribution of older Americans, whose unpaid volunteer work in 2013 was valued at $67 billion. And while “entrepreneur” might conjure up an image of a kid in that proverbial garage, twice as many successful American entrepreneurs are over age 20 as in their early 20s.. More resources have always flowed from older generations to younger ones than the reverse. This is despite widespread age discrimination in employment, which prevents older workers from finding challenging work of which they’re eminently capable, and relegates them to jobs that don’t take advantage of their skills and experience—Wal-Mart greeters, say. It also makes it harder for them to find part-time and volunteer positions. Discouraged and diminished, many become economically dependent, contributing to the misperception that olders are a net burden to society, but it’s not by choice. Society has grown far less tolerant of sexism and racism. Why do ageist attitudes and behaviors still get a pass? That’s what I’d like to know! Can you imagine anyone (not counting Donald Trump) complacently identifying himself as sexist or racist? Yet no one even blinks when older people are described as incompetent, or boring, or even repulsive. (And most people are unaware that younger people also face age bias.) Older people can be the most prejudiced of all, having had a lifetime to internalize negative myths and stereotypes that have gone unquestioned—until now. Diversity became a buzzword because society grew less tolerant of racism and sexism and homophobia. We want different faces around the table because we don’t think access to opportunity should depend on what someone looks like. Graying hair and wrinkles count. It is high time to make the last socially sanctioned prejudice as unacceptable as any other kind. If that seems like a tall order, look at how much has shifted in how we look at gender, and how rapidly. It used to be viewed as a rigid binary, male or female, but we now understand that it’s far more fluid. If gender can be conceived of this way, why on earth not age, which is inherently, obviously, a continuum? Why not shake off our fear of being on the “wrong” side of some imaginary old/young divide and embrace a more flexible, friendly, and far more rational view of age? You call yourself an Old Person in Training. Why? I’m 63. I know I’m not young, I don’t see myself as old, and I know a lot of people feel the same way. We spend a lot of energy pretending that the old are somehow not us—not even future us—and that we’ll somehow never get old. Even though it’s irrational. Even though we’re doomed to fail. Even though it fills us with needless dread. Even though that denial is where ageism takes root. That’s why I’ve become an old person in training, a phrase I appropriated from geriatrician Joanne Lynn. Becoming an Old Person in Training bridges that divide between our younger and older selves, and connects them empathically. It acknowledges the inevitability of growing old while relegating it to the future, albeit at an ever-smaller remove. It swaps purpose and intent for dread and denial. It’s a relief. It feels right and it makes sense. What’s does becoming an Old Person in Training involve? It means looking at older people instead of past them, remembering they were once our age, seeing resilience alongside infirmity, allowing for sensuality, enlarging our notion of beauty, and acknowledging that an apartment, or a room or even just a bed can be home to an internal world as rich as ours—and very possibly richer. It means thoughtful peeks through the periscope of an open mind at the terrain we’ll inhabit when we are finally old. I see the ninety-year-old me as withered and teetery, but also curious and content. Envisioning her won’t make it happen, but the aspiration will surely help. The consensus from people over eighty, who should know, is that young people worry way too much about getting old. So the earlier we make this imaginative leap, the better—and the better equipped we’ll be to benefit from the journey. 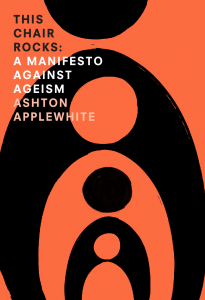 You’d like your book, This Chair Rocks: A Manifesto Against Ageism, to help catalyze a mass movement against ageism, the way Rachel Carson’s Silent Spring catalyzed the environmental movement. What kind of actions would you like to see? Look for ways in which you’re ageist instead of looking for evidence that you aren’t. You can’t challenge bias unless you’re aware of it, and everyone’s biased some of the time. Talk to people significantly older and younger than you, and listen carefully. If you don’t know many of them, seek them out. The next time you wonder whether an outing or an outfit or an attitude is age-appropriate, reconsider the question. There’s no such thing. Train yourself to notice when everyone in a group is the same age, and unless there’s some legitimate reason, speak up about it. Assume capacity, not incapacity. Don’t assume someone is too old—or too young—to weigh in on a topic or take on a responsibility. If you’re on the receiving end of an ageist comment, ask gently, “Why would you say [or think] that?” Then just be quiet. If you’re feeling ambitious, start a consciousness-raising group around age bias. This powerful tool catalyzed the women’s movement in the 1960s and 70s. You can download my guide, Who Me, Ageist?, here. Changing the culture is a tall order, but look at how women’s roles have changed in a single generation, and at the amazing progress we’ve made in this century alone against homophobia and transphobia. If this new radical age movement had a slogan, what would you like it to be? Age pride! Age pride is for dissed teenagers and dismissed olders and everyone in between. Age pride is for Maggie Kuhn, founder of the Gray Panthers, who said, “We must be proud of our age” and who, if she’d lived long enough, would have beaten me to “Occupy age!”—my other favorite slogan. If marriage equality is here to stay, why not age equality? If gay pride has gone mainstream, and millions of Americans now take pride in identifying as disabled, why not age pride? The only reason that idea sounds outlandish is because this is the first time you’ve encountered it. It won’t be the last. Longevity is here to stay. Everyone is aging. Dismantling ageism benefits us all.